Add the quintessential Woodland Friends Centerpiece to your outdoor themed party! This centerpiece fits perfectly with the Woodland Friends party supplies. The boat will look like it is sailing down the river! Some assembly is required for this item - but don't worry the instructions are on the packaging and you don't need any tools. The furry creatures in this centerpiece will bring warmth to your heart. Enjoy the neutral colors that you can often find in nature. Item comes one (1) per package. Bend creased tabs on boat sides and boat back (bottom piece with water). Slide boat tabs into corresponding slots in water. Raise back of boat and slide tabs into slots on boat sides. Make sure notches latch. Insert long seat through slits toward bear bottom. Bend creases in seat and slide tabs into slots on boat bottom. Bend creases in fox and raccoon. Insert short seat through fox and raccoon. 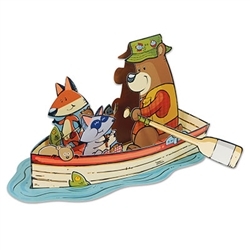 Place the oars in bear's hands. Secure tabs on bottom with tape if desired.